Shimano is not just a company that makes gears for bikes. No, they also make other stuff, such as wheels, which is what we are looking at here. Shimano produces a few different wheels. C24, C35, and C50. The numbers behind the C’s are how deep the rim is. C24 is 24 mm deep, and a lowprofile, C50 is a highprofile with an 50 mm deep section. 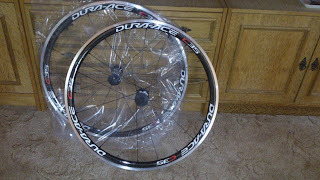 I have been testing the 2012 Shimano C35 Dura Ace Clincher wheels, the top allround wheels they produce. They are not as aero as the C50, but not as as heavy either. 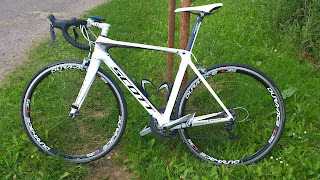 On the other hand, they are more aero than the C24, but also heavier. So if you riding in different terrain, the C35 would be a good choice. I can compare this wheel to Alex Rims and Mavic Cosmic Elite. 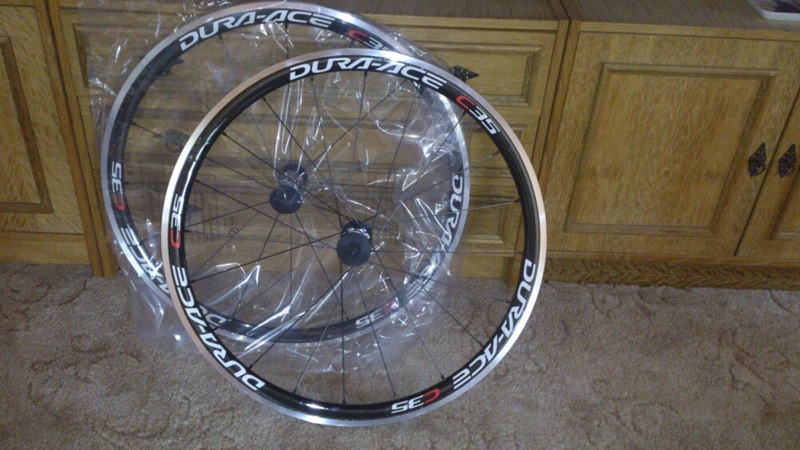 The Shimano Dura Ace wheels are known as very good value for money. 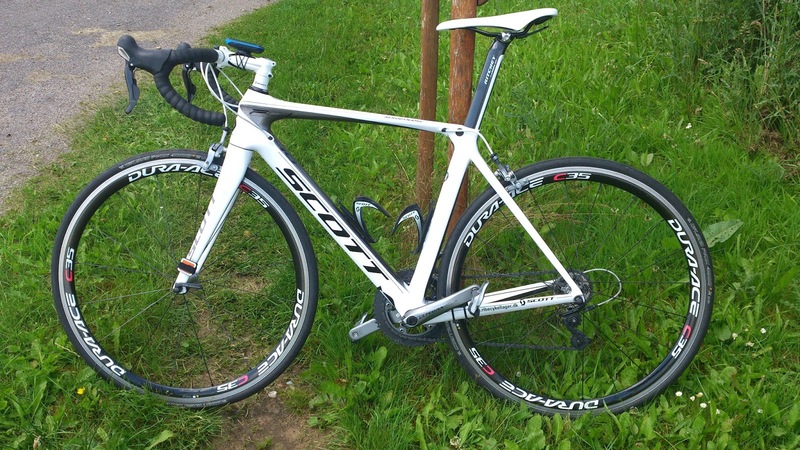 For less than 900 euro you can get wheels that achieve almost the same as wheels costing more than twice as much. The quality is also one of Shimano’s big plusses, since they always make their products amongst the best in quality. The Shimano C35 wheels I am testing are a version older than the ones being sold now. The 9000-series is a bit lighter and stiffer than the 7900 I am testing. The clincher version of the 7900 C35 Dura Ace wheels I am testing, comes in at around 1630 grams per set. That’s a little high weight, but as Shimano states, the most of the weight is located in the hub, that is made out of titanium, so it is easier to accelerate up, than the weight would make you believe. And that is believable, since the outer part of the rim is in lightweight carbon, and the spokes are in steel. So they are pretty solid too, actually they don’t have any weightlimit on them, that’s how much Shimano believes in them. The Dura Ace hubs, are also known as really really good. But more about that later. I have been riding these wheels for a year so far now, and I have only been hugely satisfied with them. Still today, they are straight when I spin them round. And I have been beating them on some pretty tough cobblestones, so its not like they have had an easy life. Compared to Mavic Cosmic Elite, they role a lot better. The hubs are just soooo smooth. Actually the hubs are so good, that I am outrolling a friend of mine on his 2-3 times more expensive Zipp 404, if we both stop pedaling, and just let the bikes roll. That’s how good the hubs of the Shimano wheels are! The acceleration of them are good too. I feel a lot faster accelerating on the C35’s than any of the other wheels I have been riding on so far. That being said, I definitely can feel, that there seems to be lighter wheels out there, and if you want to do good at criteriums or mountainclimbings, the C24, or other lighter wheels, would probably be a better choice, while for a time trial, the higher profile rims would be better. But these wheels doesn’t seem to be the worst in any case, nor the best. They are just making sure, that you are not the one having the worst wheels for any condition. When it comes to the aerodynamics, they feel good at keeping higher speeds, but there are of course better choices, if that is what you are doing all the time. In rough crosswinds, the 35 mm profile is deep enough to make you sway a little bit from side to side. Well at least for me, but since I weigh in at around 65 kg, I am far from being a heavy rider, and therefore the heavier riders may or may not, feel this in crosswind. In sprints, they are stiff enough for me at least. It does not feel like they are about to hit the brakepads when im accelerating heavy on them, which some other wheels tends to do. The hightension spokes of the wheels are doing a great job keep them straight, even when stressed out. But of course, I am a lightweight rider, so if Cancellara took them out for a trip, they could maybe not be stiff enough for a guy like him. But is there any wheels that would be that? I doubt that. I sadly have no more expensive wheel to compare them with myself, but they are by far the best of the wheels I have tried so far, when it comes to acceleration, hubs, and aerodynamics. So if you want a pair of allround wheels, the Shimano Dura Ace C35 are a really great choice. Especially if you can’t afford more expensive wheels. But as I mentioned, they are at some points, like the hubs, better than the more expensive wheels, so you are getting great value for your money.